Pure Pepper is an affair of the heart. 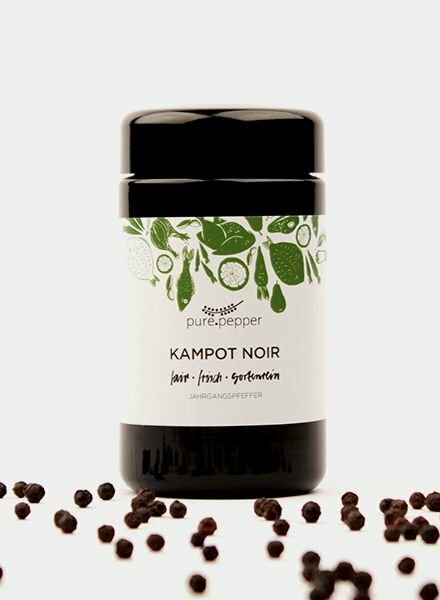 For Anja Matthes, the founder of Pure Pepper Projects, pepper is one of the most versatile and interesting spices in the world. She loves the richness and diversity of aromas and flavors that can be found in various sorts of peppers. With her growing interest in fresh ingredients and good food, Anja Matthes’ awareness of spices has risen as well. Travelling through Southeast Asia in 2009, she discovered and tried a lot of new and unusual foreign kinds of pepper. The great taste and aroma of pepper that she has experienced during her expeditions and the fact that importing thispepper will provide fair living conditions to the farmers in Cambodia, have motivated her to start the Pure Pepper Collection with Kampot pepper. The pepper is grown by Cambodian farmers in a long family tradition. This means that the pepper is harvested by hand and dried in the sun and the quality readout is also done by hand. The result is a 100 percent natural product of the highest quality. Interesting fact: this tradition was suppressed sharply in the years of the Khmer Rouge regime. Anja Matthes buys this pepper for fair and above the market leveled prices. Therefor, the production costs are covered, the existence of the farmers and their families is secured and a socially fair minded and environmental production is possible. Farmers are given the opportunity to feed their families, send their children to school and continue growing pepper in their familiar tradition with the renunciation of the use of pesticides and fertilizers. Her plan is to build a stable long-term partnership with the farmers in Kampot - one that is based on trust and respect.